Contractors begin repairs to the bandstand roof. 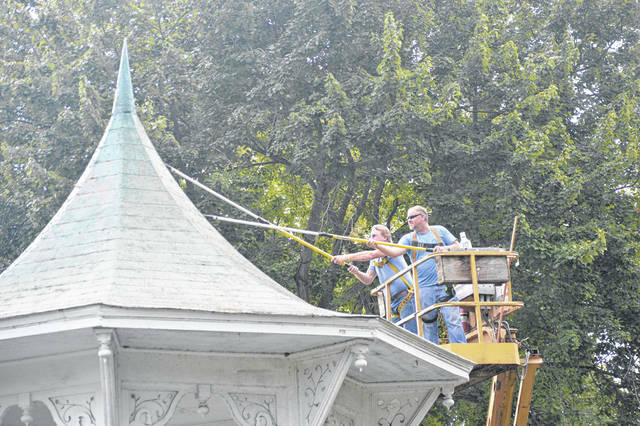 GALLIPOLIS — The Gallipolis City Park Bandstand is seeing its first major repairs in 11 years with help from the capital spending budget passed by the Ohio General Assembly, granting $37,000 to the effort. According to area historian Mary Lee Marchi, the bandstand is a memorial to those from Gallia who served in the American Civil War. The bandstand was not always white and was reportedly originally a combination of green, burgundy and yellow colors. The “old Victorian colors,” Marchi said. It wasn’t painted white until the early 1900s, around World War I. In recent years, Ariel’s Tuba Time has utilized the bandstand during the River Recreation Festival and Gallipolis in Lights holds its lighting ceremony within the structure. The last major repairs made to the bandstand were recorded in 1997, according to Gallipolis financial records, totaling around $24,900. Marchi said the park once was an area where cattle were driven towards the river to ship out on boats on the river. According to Marchi’s information and a previously published article in the Gallipolis Daily Tribune,, dated July 31, 1965, by past editor Hobart Wilson, Jr., old newspapers indicate the bandstand was possibly created some time in 1878. This is in conflict with writing on a bronze plaque embedded near the bandstand in City Park. Gallipolis City Manager Gene Greene and Marchi said they both believe the bandstand was fashioned out of redwood and cedar. The roof is reportedly a type of metal. Marchi said that in the 1990s, she believed National Geographic had come to town and taken photos of the bandstand. The bandstand is registered with the National Register of Historic Places. It has often been featured on letterheads in Gallia County as well as clothing, apparel, marketing and on locally created goods. Irvin Saunders and colleagues are reportedly making repairs and cleaning the structure, said Greene. Spindles bracing the upper floor of the structure will be replaced, Baseboard along the bottom of the structure will be replaced. The roof will be cleaned and repainted. Banisters will be replaced along with panels on the bottom of the structure. Greene said contractors and city government were still deciding whether to utilize vinyl in some of the replaced elements. Greene said that the original rough cut beams inside the bandstand were sound and that the exterior of the building was where maintenance needed done. Work on the bandstand started around Sept. 10.